At Matheson Heating • Air • Plumbing We Let Our Customers do the Talking! Your neighbors who have called on Matheson Heating • Air • Plumbing have plenty to say about their great experience with us. No other HVAC/plumbing company in this area can match our combination of personal service and quality workmanship and materials. Watch and read for yourself what your neighbors are saying about Matheson Heating • Air • Plumbing. Very happy with our purchase and service. I’d highly recommend Matheson after my first experience with them. I first met with Chris for a quote, who guided me through all of the different options for replacing our furnace and A/C. He had done his homework on our home beforehand and had the load calculations ready to go. The other quotes I got that day focused on the biggest and best systems. Chris was simply focused on finding the right equipment for my home, which was important because the previous system was far too large. On install day, the crew (Chad, Shane and Andrew) showed up with Chris 15 minutes before their scheduled time and promptly got to work. Throughout the day they were always on hand to answer any questions I had and treated my home with respect — being careful not to dent walls or scuff the floors. Chad was especially patient with all of my questions about the equipment. They finished up just before the time Chris quoted me and cleaned up everything as they left. The work speaks for itself. Very happy with our purchase and service. I would highly recommend Matheson if you have any repair needs. I recently had some problems with my air conditioner causing the transformer in my furnace to burn out. Trevor, the repair technician was amazing. He is, by far, the most knowledgeable repair technician I have ever had the pleasure of working with. I decided to replace both the air conditioner and the furnace. Scott, Tim, Rico and Chad were amazing, as well. They showed up early, were very friendly, extremely knowledgeable and completed the job in one day, as promised. They actually left the work area CLEANER than it was when they arrived. I would highly recommend Matheson if you have any repair needs. Thanks again for such an outstanding job. Call Matheson before calling anyone else. Bear with this 5 star review for a company I didn’t pay for service for. I recently purchased a house and experienced a seemingly catastrophic problem with the water softener. Not entirely knowing much about how it functions and what might be going wrong with it, I called Matheson (since I drive by them all the time) fairly late on a Friday night to see if I could get someone scheduled. When I got a call back (REALLY quickly, I might add), the gentleman calling asked some basic questions about what was going on and was able to explain what was going on. What he told me was really enough for me, a horrible DIY’er, to look at the challenge a little deeper and fix the problem myself with a little work. Not once, did I get the impression that the money they would have made off me was more important to them than the chance I might be able to fix this myself. To me, that it a SOLID and admirable business model, and I know that all those projects I have that I don’t feel comfortable doing will cause me to now call Matheson before calling anyone else. I highly recommend them for any work you may need to have done. 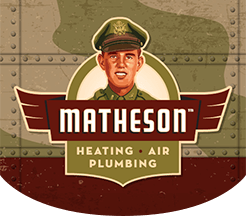 Matheson Heating has maintained our home’s heating and cooling systems since our home was new 22 years ago. They replaced our two gas furnaces in 2007, and our two air conditioning systems this summer. They are a top-notch firm. The employees are excellent to work with: sales, repair, installation, follow-up. SUPER in every way. I highly recommend them for any work you may need to have done. Top notch work. I’ve had them do a number of projects for me and the service has always been great and the pricing is fair. Have used Matheson for years on projects. I had met with Chris the salesmen who was very knowledgeable. After speaking with him I knew I didn’t need to see any other quotes. He knew I had no furnace and small children. He was able to have my furnace installed the next morning. He sent Eddie and Jake to do the installation and they were fantastic. I have dogs which they were not concerned abt me leaving them inside with them. They were quick, efficient, and very professional. I will and already have recommended them to friends and family. They finished up and called to see how they should leave my baby gate, my dog and my front door! I love the work they performed and my pooches even loved them! Highly highly recommended!!!! I'll definitely be calling Chris again to bring Matheson back into our home! I rarely write reviews, but I believe in giving credit where credit is due – Matheson installed a new water softener, central air for our first floor, and two ductless heads and outside unit for two bedrooms upstairs for more efficient cooling. Everything was handled professionally and promptly from out first interaction with Chris, our sales agent, to Scott and his installation crew. Chris did an excellent job of handling all my questions pre and post installation, and I never felt like he was trying to up sell us, but merely advise on what we truly needed. When our furnace finally goes, I’ll definitely be calling Chris again to bring Matheson back into our home! If you are interested in working with our team, call our HVAC experts at (248) 363-4868. You can also submit our online form to get started.